The Huge Bear name comes from an article discovered in the local historic archives from the mid 1800s. The story chronicles the adventures of a huge bear that would come down from the mountains in search of food, surprising the local Justice of the Peace whose home he routinely raided. That elusive bear was never trapped. During this time Thomas Knight (namesake of Knights Valley) was leading the charge to raise the Bear Flag and pronounce California as an independent state. We imagine that the Bear Flaggers were inspired by this local bear, and decided to celebrate the bear’s independent spirit on the California State Bear Flag. 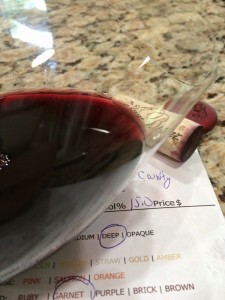 Deep color depth with a garnet hue. Aromatic, young-fruity with aromas of sweet jammy dark fruit (black cherry, black berry), spice, cocoa. Dry, full-bodied with great acidity (my mouth salivated with each sip). Medium but soft tannins. Rich mid-palate with a long savory finish. The wine is 100% Cabernet Sauvignon fruit. We know winemakers who have vineyards in the Knights Valley who have not see bears, only the left overs (piles) they leave after pillaging vineyards. It appears the Huge Bear is still alive and continues to wander through the valley looking for food. They love eating the grapes when they are ready to be harvested. This is the time when the grapes have the highest sugar levels. 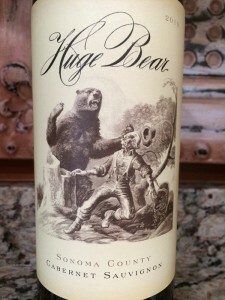 I rated the 2010 Huge Bear Wines Cabernet Sauvignon four glasses.